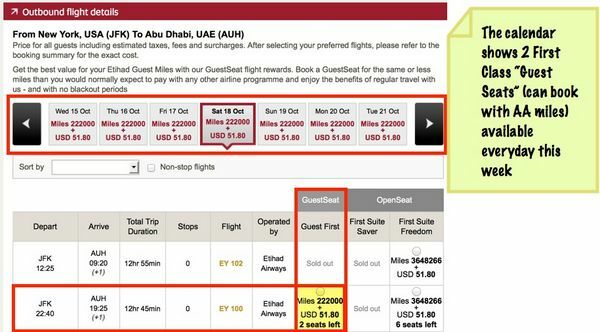 The best free way to find award seats on Etihad Airways is to sign-up for Etihad Guest, the airline’s mileage program. You do NOT need any miles in the program to perform an award search! 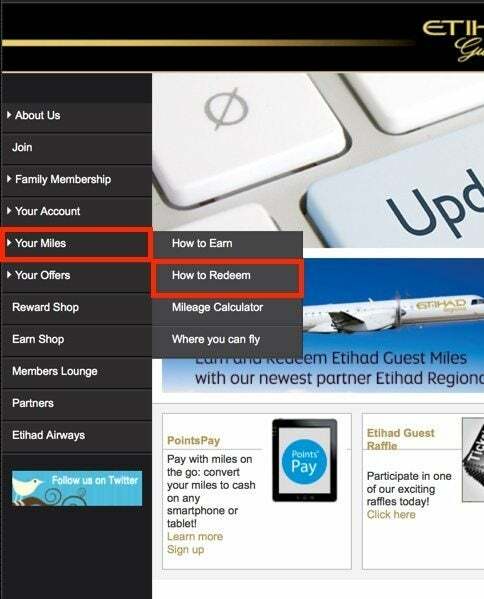 Tip: I entered my Etihad account into AwardWallet, so I just clicked “Etihad Airways (Etihad Guest)” in my AwardWallet account to login! 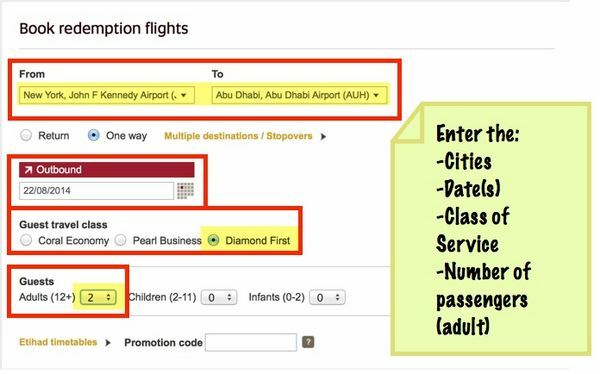 You can look for award seats on Etihad using this link, or follow the steps below. 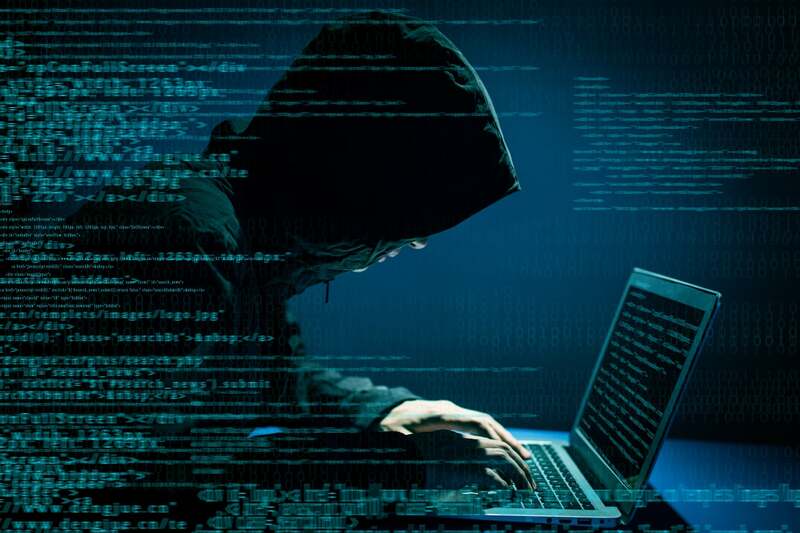 Log into your Etihad Guest account. Let’s say you’re looking for 2 First Class award tickets from New York to the Maldives. 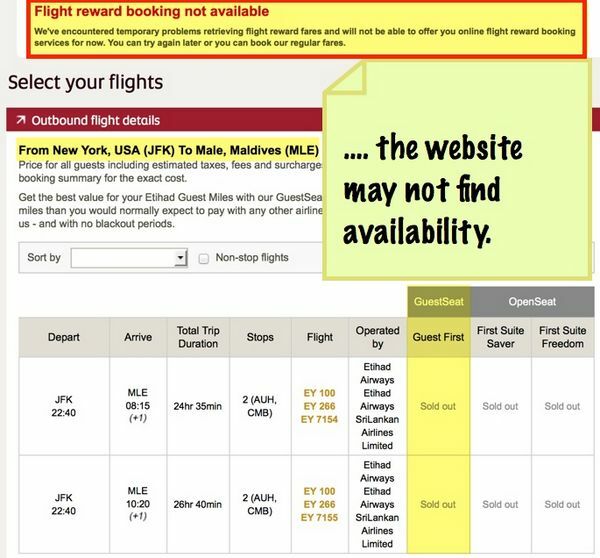 What happens when you search for a trip from New York (JFK) to Malé (MLE)? Can You Find 2 First Class Seats From New York to the Maldives? Your search results implies that all First Class award seats are booked. No First Class for You! Fortunately, Million Miles Secrets readers know that you should try to search for award seats by each segment! So let’s search for 2 First Class tickets from New York to Abu Dhabi and then from Abu Dhabi to Malé. We’ll 1st search for New York to Abu Dhabi for 2 people in October in First Class. Book a “GuestSeat” because you can get those seats with American Airlines miles. You can’t use American Airlines miles for “OpenSeat” award tickets. Don’t get scared by the number of miles required, 222,000 (for New York to Abu Dhabi). Those 220,000 miles are the number of Etihad miles that Etihad Guest members have to pay for these seats. American Airlines only charges 90,000 miles 1-way for the same First Class seat from New York and Abu Dhabi! If you can’t find seats on the date you want, the calendar at the top of the page shows when award seats are available. Search for award seats from Abu Dhabi to the Maldives (Malé). Note: This is a regional route, so there is only Business Class and coach available. 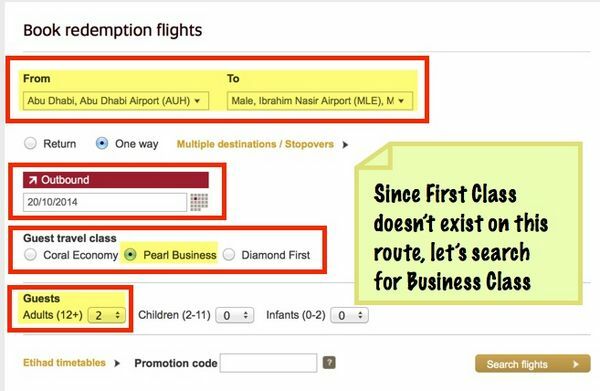 If you search for First Class award seats between Abu Dhabi and Malé, the website will show no seats because First Class doesn’t exist! Let’s search for Business Class seats between Abu Dhabi and Malé. Your search will reveal which seats are available. Because 2 Business Class seats are available at the “GuestSeat” level, we can book those seats with American Airlines miles. 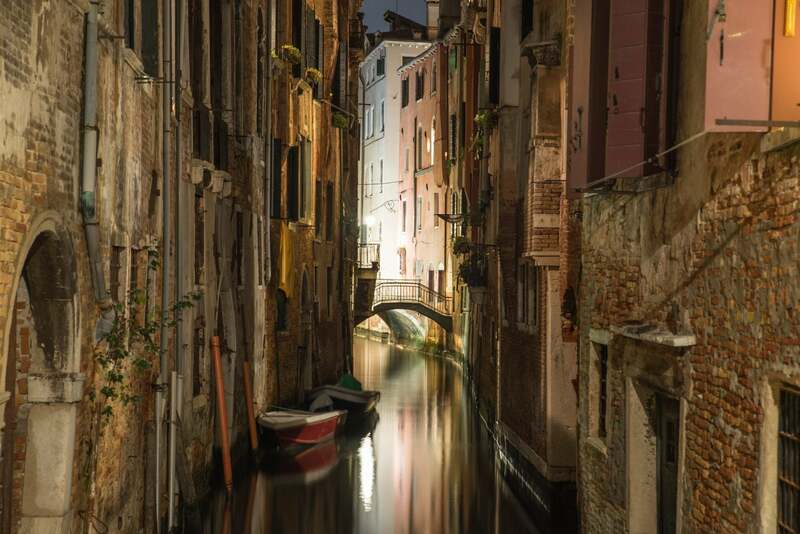 Write down the dates of the flights and call American Airlines at 800-882-8880. I called American Airlines and gave those flights to the American Airlines agent who was able to hold the seats in only a few minutes. 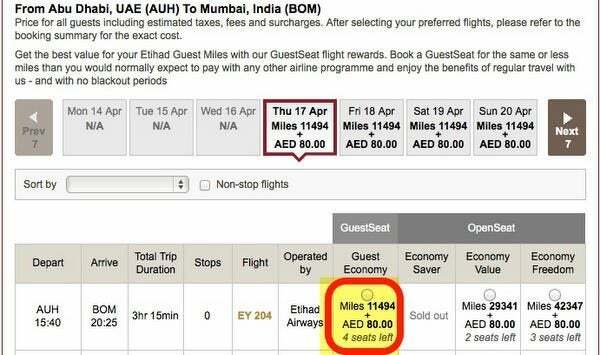 The total cost for 2 First Class tickets from New York to the Abu Dhabi and 2 Business Class tickets from Abu Dhabi to the Maldives was 90,000 miles + ~$4 in taxes a person 1-way! Note that you will have to pay a telephone booking fee of $35. Note: This itinerary requires an overnight stay in Abu Dhabi, which you have to pay for yourself. But Etihad includes chauffeur transfers to and from your hotel if you fly in First Class! If you fly in Business Class, you can use up to 2 chauffeur transfers on each journey. Here’s another example, but this time in coach. Because I live in Austin which isn’t an Etihad gateway city, I need to get to a gateway city like Chicago (from which Etihad flies). I search on the American Airlines website to find a flight from Austin to Chicago. I can’t search for Etihad flights on the American Airlines website. But we know that you can find award seats on the Etihad website! After logging into my Etihad Guest account, I search on the Etihad website for flights from Chicago to Abu Dhabi. Then I search for flights from Abu Dhabi to Mumbai. 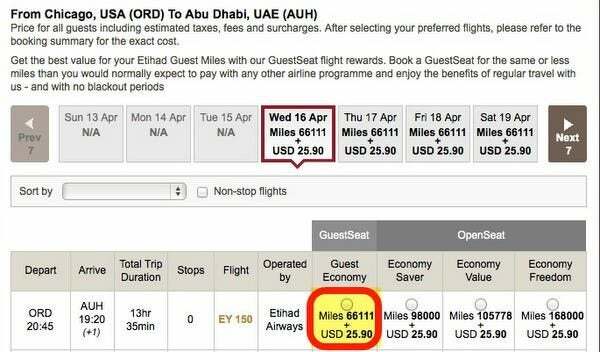 Because I can’t book Etihad award seats online using American Airlines miles, I call American Airlines at 800-882-8880. My flights to India, including the flight from Austin to Chicago, cost 45,000 American Airlines miles + ~$30 taxes in coach! This is much better than using American Airlines miles to fly on British Airways to India, because I’d pay hundreds of dollars in fuel surcharges for that flight! 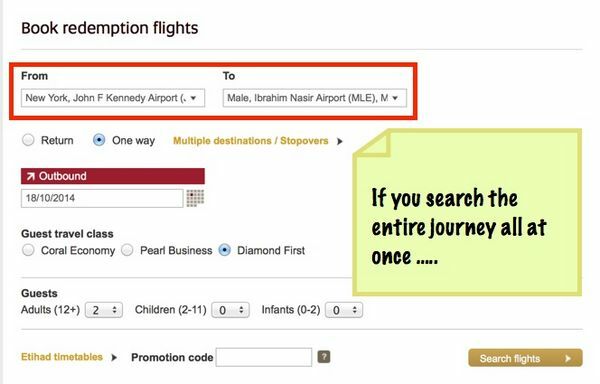 You can search for award seats on Etihad’s website. But you have to have an Etihad Guest account. 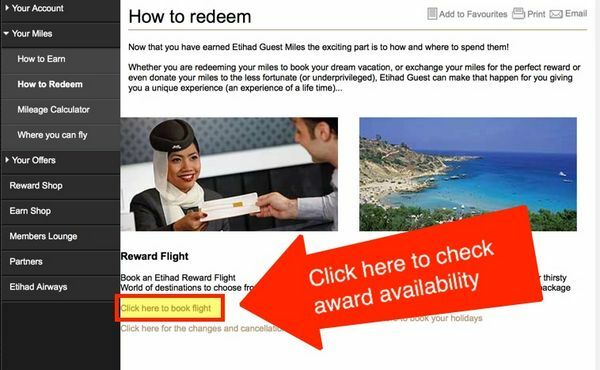 An Etihad Guest account is free and easy to create. 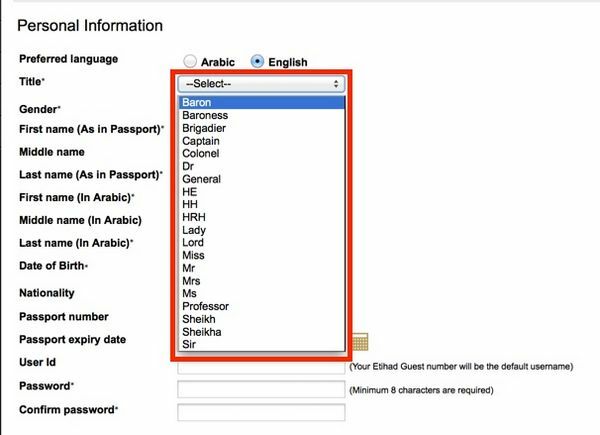 After you’ve created your Etihad Guest account you can search for award seats. 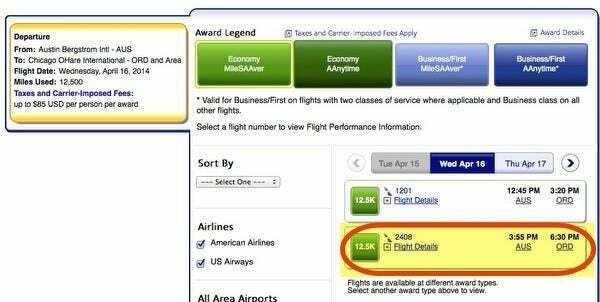 When using American Airlines miles, search for available “GuestSeat” award seats. If you can’t find award seats, try searching for each flight segment separately. Very well written and concise article. Has anything changed since it was written? Me and my SO have separate AA accounts and would like to book tickets together but we don’t have enough miles for doing that. If I call and give mine and my SO’s AAdv number will the agent be able to book two separate tickets on the same flight from two separate AAdv account numbers? I am planning to travel to Bangalore, India on September 23rd 2016. Please guide me on how to make the flight free to the forward and return journey. I have a business class booking with EY, using AA miles, and am trying to look for availability in first for one of the legs. Any clues / ideas ? 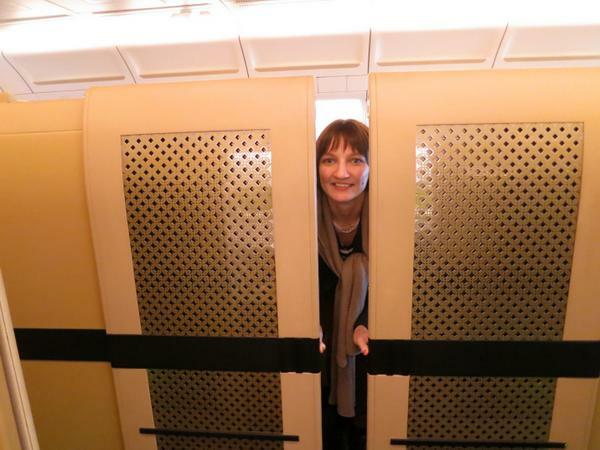 Hi, How many AA miles are required from Abu Dhabi to BOM on Business class of Etihad ? ?